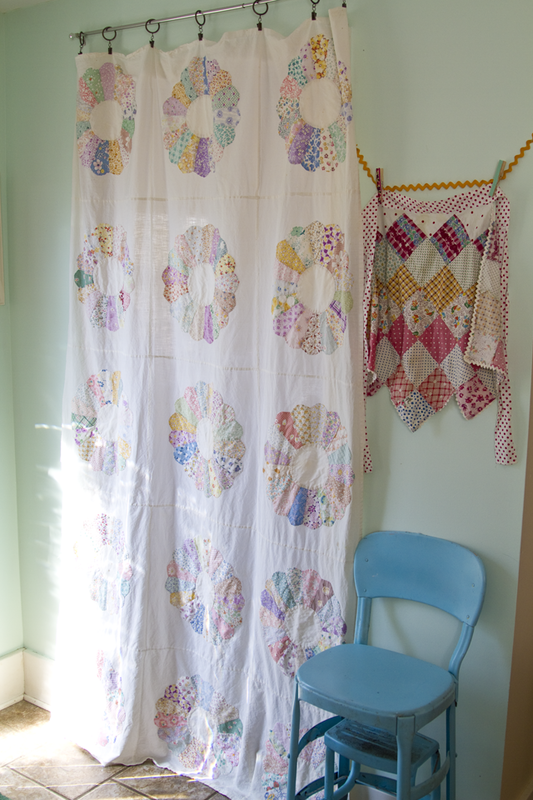 Black and White and Loved All Over: Dresden Plate Quilts, Pastels, and My Inner Granny. 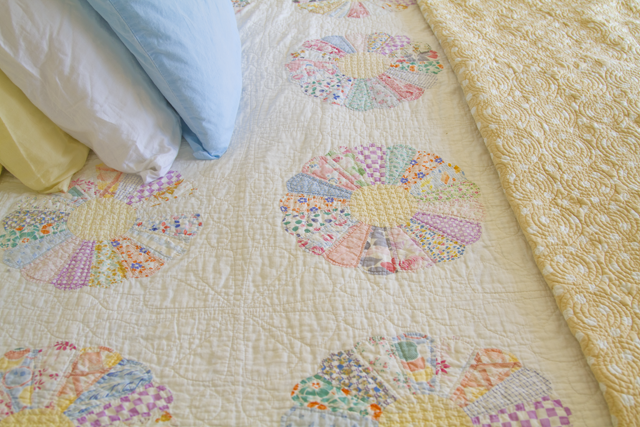 Dresden Plate Quilts, Pastels, and My Inner Granny. I'm a big kid with a potty mouth, but I just so happen to have the home decor preferences of a 75-year-old. Especially when it comes to textiles. I like chenille bedspreads and funky patterned sheets, and most of all: quilts. Last week I gave the granny inside of me the thrill of her lifetime and bid on and won two quilts on eBay, one a Dresden Plate pattern and one with appliqué butterflies. Both are purportedly from the 1930s or '40s and seem meant for snuggles and picnics and photo backdrops for years to come. I was crossing my fingers that they were as lovely as they looked in the pictures, and they so are. They arrived in the mail this week, all perfectly faded and well-cared-for, pieced together by hand with scraps of fabric that have my heart. My imagination goes bananas when I look at these quilts. Who made them and for whom? Was it a wedding present or a personal project, and were the fabrics sourced from outgrown baby pinafores and handkerchiefs or from painstakingly collected feed sacks? I laundered the quilts immediately with lavender soap and my trusty Bounce Bar and then showed them their new home. I knew that I wouldn't be able to find a vintage quilt big enough to fit our king-sized bed, as the king-sized bed wasn't introduced until the mid-1950s. (I had to go look that up.) So it's just draped over the top of our bed. Today the sun is spilling across it, and baby Livvy looks especially pretty napping against the old-fashioned Dresden plates. I swear I've slept better the last two nights under this beautiful old quilt. Good nights make my days better. That and the sunshine, which has elbowed its way into every corner of the house. Today I made the beds and wandered around taking photos of some of my favorite spots here. I am so grateful for this old bungalow and for a husband who lets me granny up the place. 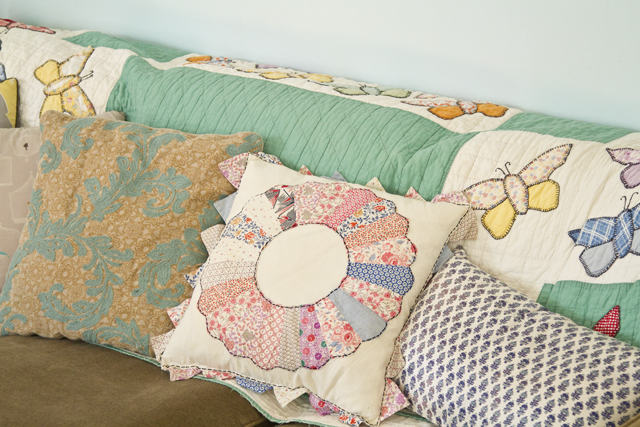 I put the butterfly quilt on the back of our couch. Even though Tessa is mad about that. She wants it on her bed. I also found this adorable old Dresden plate pillowcase on eBay for 10 bucks. And then there was this quilt top that I got for $30! 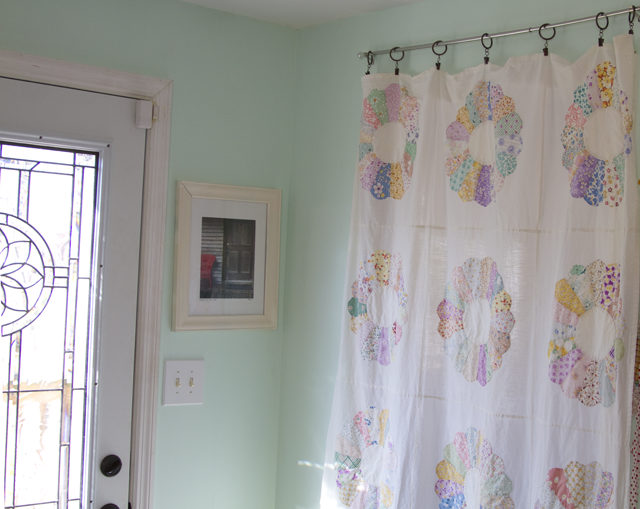 I cut it in in half and turned it into a curtain to cover up the ever-present mess in our little laundry room. I am so happy with it. 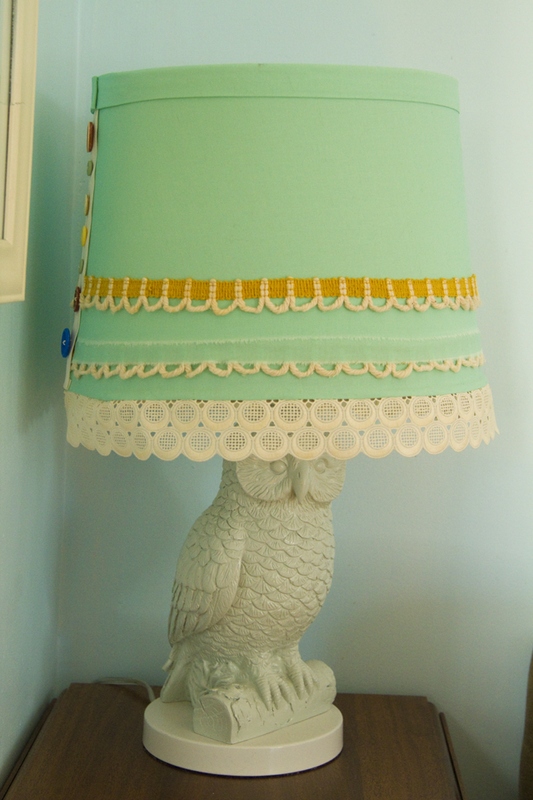 This lampshade is from this darling little shop in East Nashville called Eclectic. The shade was made by a local company called Sisters of Nature. I literally couldn't live without it. And this is the bench in our hall upstairs. 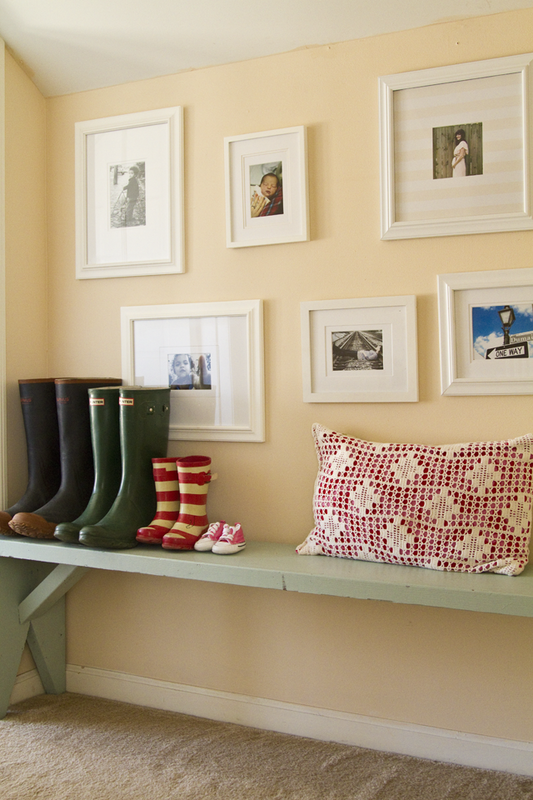 I painted it Benjamin Moore's "Wyeth Blue" a few months ago (same as our front door and the mantle in our bathroom), and we like to keep our rain boots lined up here--a modern day Papa Bear, Mama Bear, and Baby Bear. Livvy needs rain boots, too. For now, her hot pink Coverse are here. This post makes me happy and smiley. I share your love for Granny style. Ahh! The strap fell off of your Hunter boots too? That happened to mine. I wonder if it happens a lot. I was kind of upset about it. The boots/shoes look so cute all lined up like that! I love your house! I love those quilts and the "granny-chic" vibe you have going on! I have a stack of hand pieced quilt squares made by my great-grandmothers back in the 40's/50's that I'm terrified to do anything with. I'm trying to work up the courage to start a quilt for my girls. Totally random question: That yellow/gray pillow that is the first on the left of you couch. Have you ever thrown that in the washing machine? I have the same one and it could use a turn in the wash and was wondering if it will hold up. How did you start getting a flow of color to weave amongst your uniqueness? I feel that we have clashing colors in our house but a sense of uniqueness. I want both! Did you just take a palate of colors and work from it? 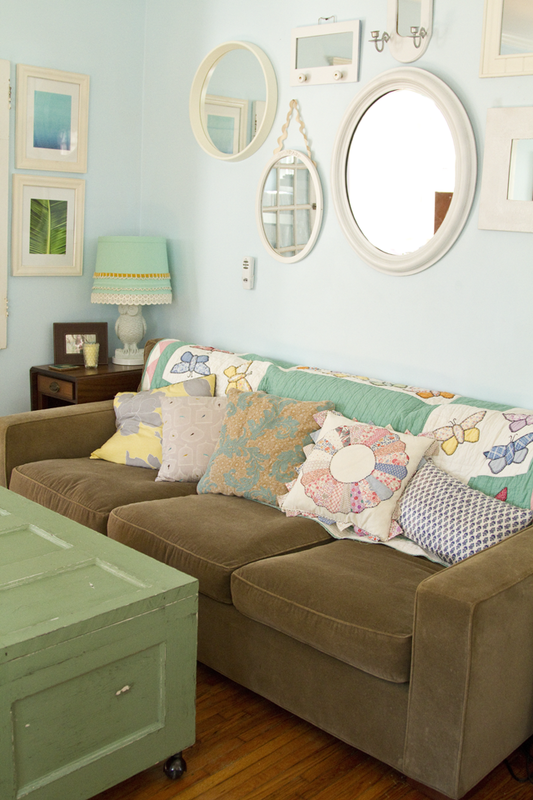 or paint one room and then deny yourself the urge to make the next room a different extreme? I am relaxing on my bed on top of a dresden plate quilt. It may be my favorite pattern. 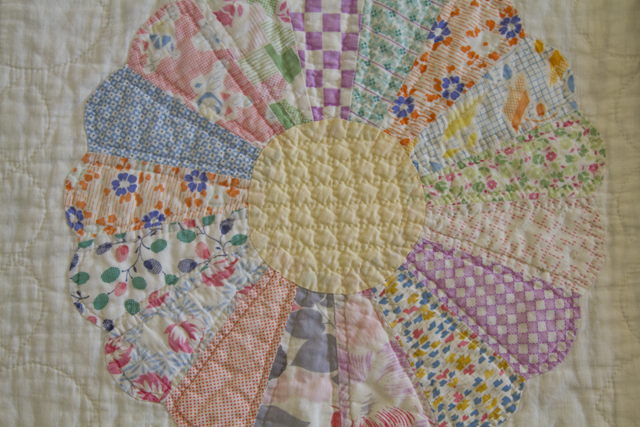 I was looking for another quilt online, when I found your blog. It made me feel all sunshiny inside. My sister is a huge quilt collector. She has maybe five hundred or so. I wish she would part with a few. I want to make the quilt pillows, but it makes me feel like a criminal to cut the quilts up for that. Maybe one that has no hope for repair will come into my hands in the near future. I love your blog and your decorating ideas.